Antisocialites – the much-anticipated followup to Alvvays’ 2014 self-titled debut – is set for release on September 8. Across its 10 tracks and 33 minutes the Toronto-based group dive back into the deep end of reckless romance and altered dates. 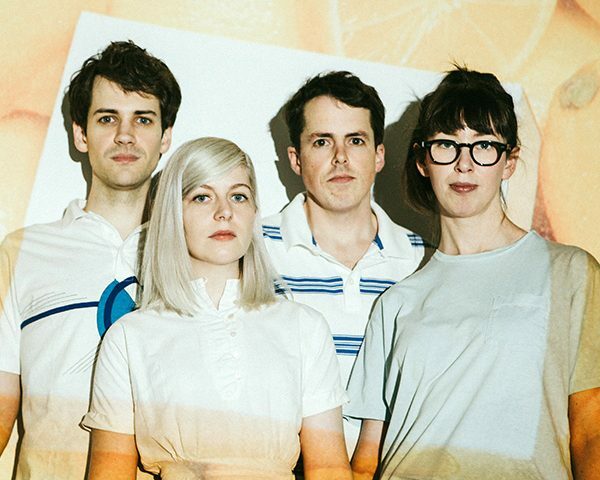 Through thoughtful consideration in basement and abroad, Alvvays has renewed its Scot-pop vows with a powerful new collection of manic emotional collage. Rankin’s shining wit is refracted through crystalline counterpoint. ‘Not My Baby’ is a centerpiece, a meditation on the rapture of escape following the sadness of separation. Elsewhere, ‘Plimsoll Punks’ is the band’s answer to Television Personalities’ ‘Part-Time Punks’ and a winking surf opus indictment of the self-righteous who intend to condescend. Molly wrote the rapid-fire sugar stream ‘Lollipop (Ode to Jim)’ after singing ‘Just Like Honey’ with Jesus and Mary Chain. ‘Your Type’ is a beautiful primitive stomp about running around Paris with vomit on your feet post-Louvre ejection. The record concludes with a movement that is at once stark and celebratory. On ‘Forget About Life,’ the apartment stands in disarray as undrinkable wine is inhaled: “When the failures of the past multiply and you trivialize the things that keep your hand from mine, did you want to forget about life with me tonight?” The resonant freaks in Rankin’s tales don’t find much resolve, but with equal doses of black humor and heartstring-tugging, Antisocialites rings a truer tone.